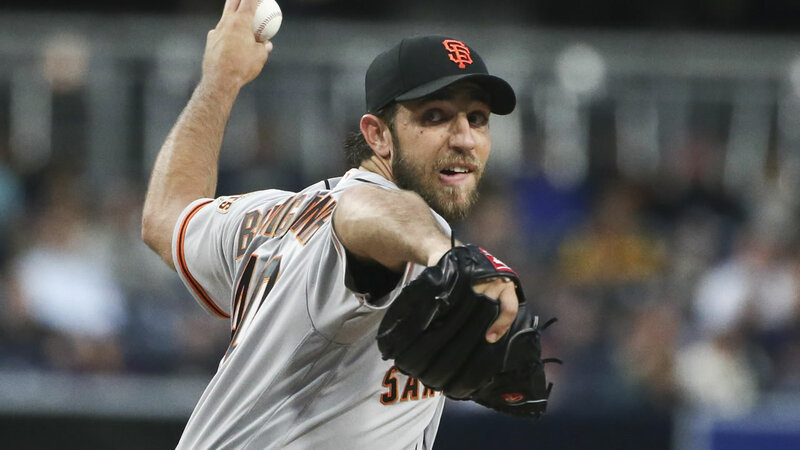 SAN FRANCISCO -- Madison Bumgarner threw a five-hitter and struck out 11 for his first complete game this season and Brandon Crawford homered and drove in all five runs to lead the NL West-leading San Francisco Giants to a 5-1 victory against the San Diego Padres on Tuesday night. The benches cleared after Bumgarner struck out Wil Myers to end the third. Bumgarner stared at Myers as he walked off the field, and the two exchanged words. They had to be separated, but no punches were thrown. Bumgarner and Myers, the Padres' first baseman, appeared to laugh off their differences when the pitcher walked leading off the ninth. Bumgarner (5-2) came within three outs of a shutout before allowing Matt Kemp's homer off the third deck of the Western Metal Supply Co. building in the left field corner, his 10th. The Giants won their season-high sixth straight game. The Padres were shut out for the 10th time, most in the majors. The Giants have beaten the Padres 12 times in their last 15 games and all four this season. Bumgarner was dominant from the start in pitching his 12th career complete game. He retired the first six batters before Jose Pirela doubled to left and was stranded. The Padres had a big chance to break through against Bumgarner in the sixth. Brett Wallace hit a leadoff single and moved to third on Myers' one-out double to left-center. Bumgarner struck out Derek Norris, and first baseman Brandon Belt made a nice catch of Kemp's foul pop to end the threat. Bumgarner, who walked none, is 4-0 in his last six starts against the Padres. Crawford hit a three-run homer to right-center off Colin Rea in the second, his fifth. He added a sacrifice fly in the sixth and hit an RBI double in the eighth and was thrown out trying to stretch it into a triple to end the inning. Belt doubled and Hunter Pence singled ahead of Crawford's homer. Pence scored on Crawford's double. Rea (3-2) allowed three runs and four hits in five innings, struck out three and walked two.